Kitchens and families go together. 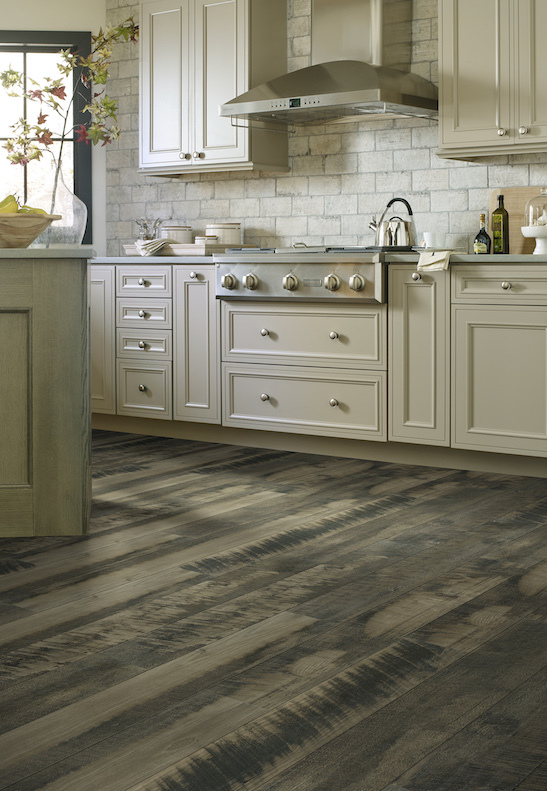 Because kitchens are the most often used room in the house, you need more than just a Beautiful Floor. Spills. Stains. Throw in scuffs and scratches, a couple of kids, some pets, mud from the backyard, asphalt driveway sealer that gets tracked into the house - well, you get the picture. You need a rock hard wearlayer. Scuff, scratch and stain resistance. Then there's the moisture issue. And perhaps most important of all, you absolutely need a floor that is easy to clean. But you don’t want to sacrifice style and design. Simply put: kitchens demand a floor that performs and today’s vinyl floors (LVT, WPC/MLF, rigid core, sheet vinyl and tile) are uniquely up to that challenge. Vinyl is a soft and forgiving floor (baby won't get hurt too badly if she stumbles and falls, and it might even to save that dropped dish from cracking). At the same time, it is one of the best floors at resisting scratches, stains, dents, dirt and is also easy to clean and maintain. Bonus - vinyl is extremely affordable and in a wide range of price points. Plus, you no longer have to sacrifice style and design with today’s luxury vinyl products. 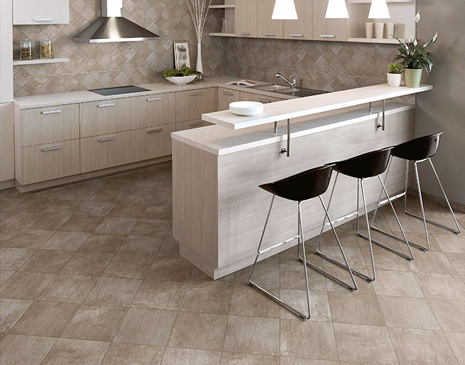 Vinyl floors offer beautifully realistic wood, stone and ceramic tile looks. Today’s vinyl floors also offer a variety of installation options from professionally installed to do-it-yourself if you’re looking to save a few bucks. Next on our list is ceramic tile. While ceramic and porcelain does outperform even vinyl flooring against stains, scratches, scuffs, wear and more, it can end up being quite expensive. This classic floor offers all the beauty of a completely natural product with some of the most fashion-forward designs in flooring. Add a backsplash for extra impact and you have a kitchen that is sure to grab lots of attention. And, it will last a lifetime if properly maintained. Maintenance is one thing, cleaning is another. And that’s why ceramic tile comes in at number 2: Food, stains, dirt, spills, these can easily discolor the grout (unless it is sealed – yet another expense) and may require professional cleaning. Still, ceramic tile is a natural and Beautiful choice for any kitchen. There are two types of bamboo and both are suitable for kitchens. Bamboo offers increased hardness and water resistance, especially in the strand bamboo format. These floors not only have a distinct “wood” look, they can give you all the performance you need for an active kitchen. Of course, for an all-natural look, it’s hard to beat hardwood flooring, but you'd rightly be concerned about how it will hold up in a kitchen. The good news is that today's engineered wood floors are made to stand up to all sorts of abuse. The bad news is that they are highly reactive to water and moisture (although many now offer moisture-resistant treatments that make them more suitable for today’s kitchens). You absolutely should choose engineered hardwood if you’re planning on adding it to the kitchen. Darker colors are also effective at hiding some of the day to day issues you’ll find in the kitchen. Either way, look for enhanced wearlayers and performance features – you’ll need it! Laminate can give you the look and feel of hardwood at a great price, but it is even more reactive to moisture. 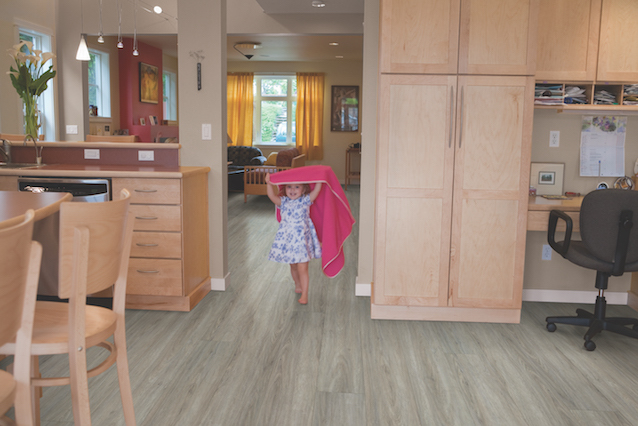 While many new laminate floors now feature warrantied spill protection, only the best laminate with moisture protection can stand up to water for long. It will, however, stand up to wear and tear exceptionally well. 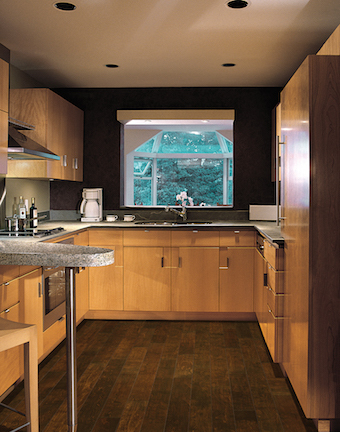 Laminate is a good choice for kitchens, but choose spill and moisture resistance if you want a floor that will last. Cork is essentially manufactured the same way as laminate flooring with the difference being that instead of a paper visual layer, it is usually a thin layer of real cork. That means that it has an advantage in terms of comfort. There are cork floors with built in spill and moisture protection as there is in other laminate constructions; without it, I would not use any laminate construction product in the kitchen, not even cork. Cork is definitely offers one of the most striking and unique visuals in flooring. If you thought ceramic tile and hardwood were expensive, wait till you see the price of natural stone and marble. No doubt, it looks magnificent, but you will pay dearly for it. Plus, marble (for sure) and some other natural stones may still require the use of a sealant for additional protection. It’s a great choice if you can afford it. Don't forget, installation costs for natural stone will also be high. Carpet remains arguably the best value in floor covering and is the number one seller, but I recommend against it if you have an active, working kitchen. But if it's carpet you want, then ask about polypropylene, a fabric that naturally resists stains, won't mildew and still provides that comfort underfoot that no hard surface floor can match. On the down side, it too easily traps cooking odors and the like. Personally, I would avoid carpet in the kitchen. A better option is a hard surface floor with an area rug that can be easily cleaned or replaced when needed.